In addition to the benefits of the existing power optimizers, such as added energy, flexible design, module-level monitoring and safety, the P400-5NC4ARM is optimized for the next generation of high-power modules, improved inventory management, faster installation, and compliance with the VDE-AR-E 2100-712 Fire Safety Standard. 5-Series power optimizers have the same electrical ratings, functionality and mechanical interface as 2-Series power optimizers. 5 and 2-Series power optimizers are fully interchangeable. 5-Series power optimizers are rated IP68/NEMA6P and have smaller mechanical dimensions compared to 2-Series. 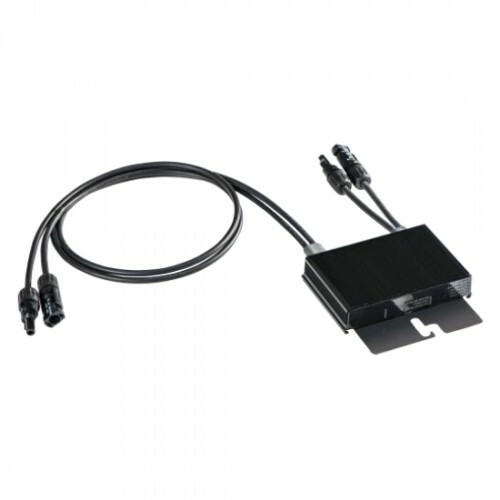 The SolarEdge power optimizer is connected to each module, replacing the traditional solar junction box. Each power optimizer maximizes energy output from each and every module through constant tracking of the Maximum Power Point individually, per module. Furthermore, the power optimizers monitor the performance of each module and communicate performance data to the SolarEdge monitoring portal for enhanced, cost-effective maintenance. When working with SolarEdge inverters, power optimizers automatically maintain a fixed string voltage, allowing optimal efficiency of the SolarEdge inverter and giving installers greater flexibility to design optimal PV systems. The independent optimization (IndOP™) technology allows power optimizers to be installed without the need for additional interface hardware and to operate directly with any inverter. Each power optimizer is equipped with the unique SafeDC™ feature which automatically shuts down modules' voltage whenever inverter or grid power are shutdown.